Blackberry Primitives put this kit together with their gorgeous wools. This primitive all wool applique hanging or mat is regularly $60. Cyber Week sales price is $30 for pattern and kit. Available wool backing regularly $17.80 is on sale for $9 during Cyber Week. Limited number of kits are available only on the website, woolkeeper.com. Colonial Knots Gathering this Saturday, December 6th from 10 a.m. to 2 p.m. at Prairie Stitches Quilt Shoppe is FREE. Hope you can come stitch with us. 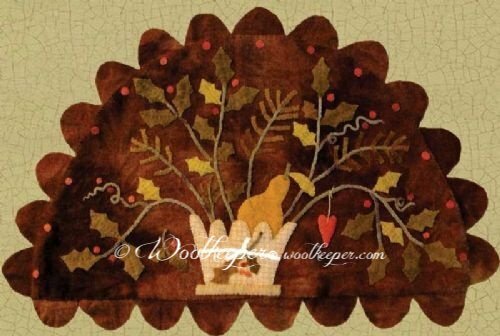 Happy Holidays from Woolkeeper!